10) Under no circumstances should you place your dog in the back of a moving truck. Even safely tucked in a well-ventilated pet travel carrier, the truck is almost always hot (even in winter) and of course, the doors are closed. 9) Your dog will most likely either want to play with the movers or eat them, so if possible, find a babysitter or board him or her. This way you can devote your total attention to your moving activities. 8) If your dog must be with you during your move, keep your loved one outside or out of the movers’ way. Dogs crave the attention of strangers and can create obstacles which will impede the move. 7) Have a large bone and dog treats on hand for move day. A big bone can keep them busy for long periods of time. Treats can be a good way to get your dog to listen and obey. It’s a great idea to have water and nutritious human treats for your movers as well :). 6) Pack a separate box of your dog’s favourite toys. Once at your new home, your dog may be frightened of the new surroundings. So having familiar play things ready will reduce stress levels. 5) Don’t forget that your dog will be excited on move day and will need plenty of exercise and water. Exercise is the best way to get your dog ready, more relaxed, and calm for when the movers arrive. Depending on your dog’s age and size, draining his or her energy level may not be easy, so plan frequent walks. I know that a 30-minute walk barely makes a dent in our dog’s energy level. 4) Make sure you let your dog out for “potty” breaks. Nothing will ruin your moving day experience more than a ‘surprise’ from your dog inside your new abode. Keep him or her on your property to avoid making a bad first impression on your neighbours. 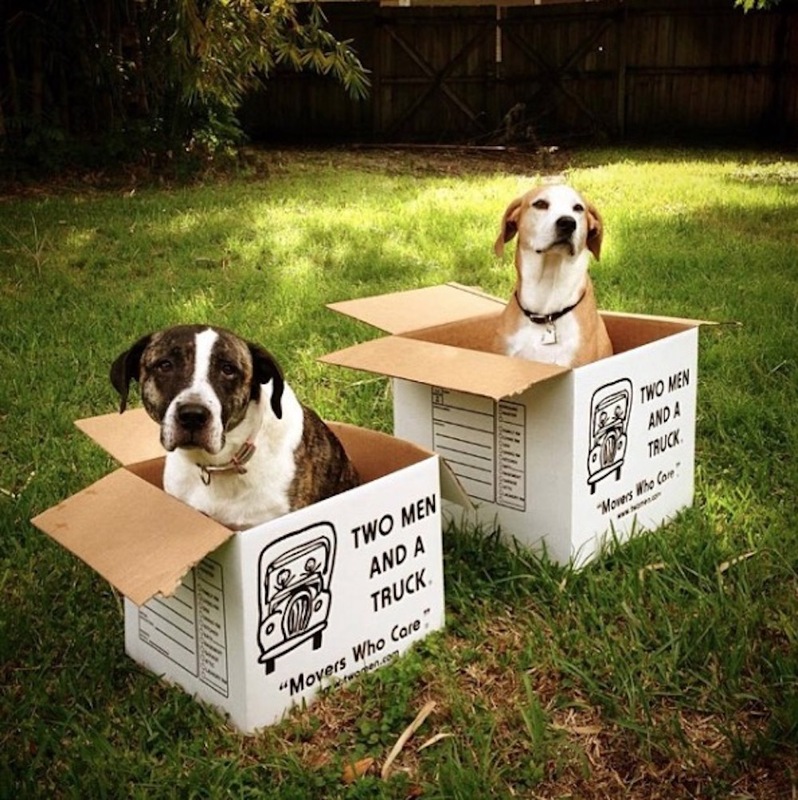 3) If your dog will be around during the move, let your movers know ahead of time. You’d be surprised how many strong men and women are afraid of dogs. Whether large or small, it doesn’t matter. Also, there are people that are allergic to dogs. Knowing ahead of time allows us to put the best team together for your move. 2) After the move you will be busy unpacking, so don’t ignore your dog. Take regular and long walks if you can, to explore your new neighbourhood together. Even short breaks from unpacking to play, can be very helpful for you and your dog. 1) Have fun! Moving into new digs is a time to celebrate. Ask the movers to take pictures of you and your dog in your new home. It’s always nice to have reminders of the big days in life.